A letter from J. P. Cullen to construction engineer Paul H. Heimer inquiring about the name and address of the District Engineer. Cullen was the head of J. P. Cullen & Son, the general contractor for the construction of the new Downtown Orlando Post Office building, located at 51 East Jefferson Street. Heimer was the construction engineer. The original post office was housed in the Federal Building, located 44 East Central Boulevard in Downtown Orlando, Florida, from 1917 to 1941. In 1935, when James D. Beggs, Jr. became the postmaster, he began petitioning to move the post office from its Central Boulevard and Court Avenue location to a more spacious building. In 1939, St. James Catholic Church sold a plot of land on Jefferson Street for the new building. The building, located at 51 East Jefferson Street, was designed by Louis A. Simon in the Northern Italian Palazzo Revival-style, and was constructed by J. P. Cullen & Son. The new building opened in 1941 and housed the post office, the courthouse, and Internal Revenue Service (IRS) offices. The building was named an Orlando Historic Landmark in 1989. However, it was eventually sold back to the St. James Church. In 2003, the building was renovated and came under joint ownership by both the church and the federal government. Today, the building retains its post office services but also includes offices for the Catholic Diocese. Original letter from J. P. Cullen & Son to Paul H. Heimer, April 30, 1941: Private Collection of Texann Ivy Buck. 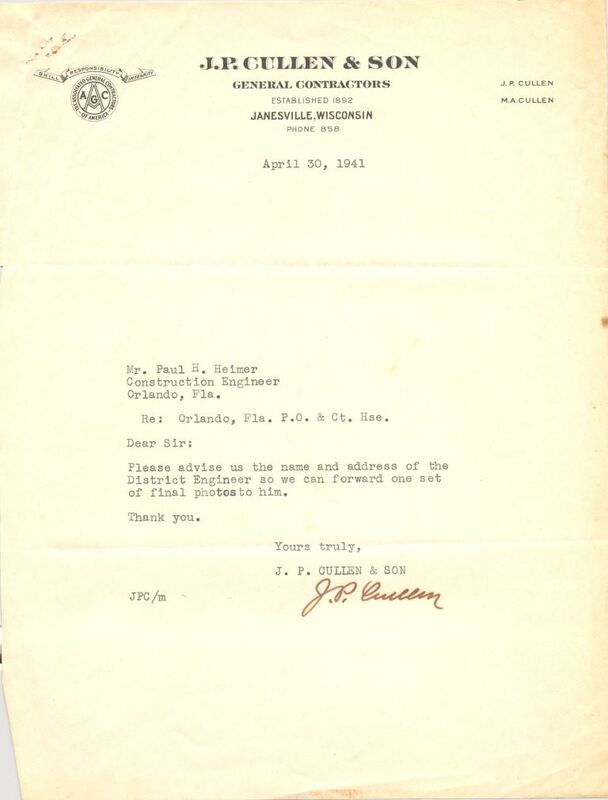 Digital reproduction of original letter from J. P. Cullen & Son to Paul H. Heimer, April 30, 1941. "Letter from Paul H. Heimer to J. P. Cullen & Son (May 3, 1941)." RICHES of Central Florida. https://richesmi.cah.ucf.edu/omeka/items/show/7608. Originally created by J. P. Cullen. Kilsheimer, Joe. "Old Post Offices Aid Revitalization Efforts." AMERICAN CITY AND COUNTY. 119: 20-21. 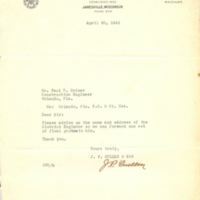 Cullen, J. P.. “Letter from J. P. Cullen & Son to Paul H. Heimer (April 30, 1941).” RICHES of Central Florida accessed April 20, 2019, https://richesmi.cah.ucf.edu/omeka/items/show/7603.